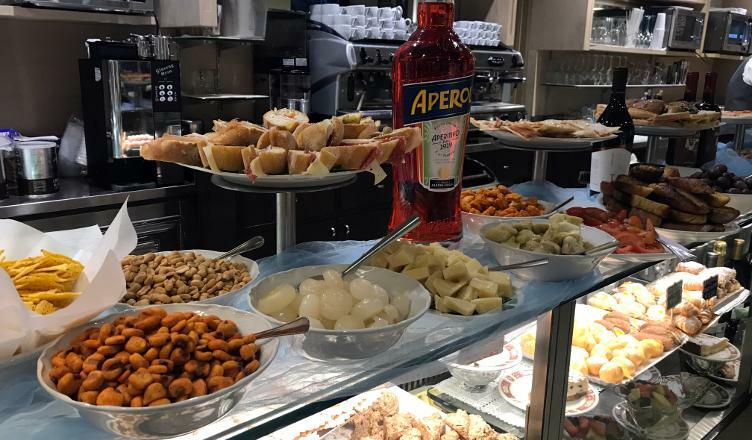 Milan has a wonderful Happy Hour tradition know as the aperitivo. Though this tradition is well-known throughout Italy, it exists in its most extravagant form in Milan. The practice is meant to give you something to snack on to open up your appetite ahead of dinner. Instead of slashing drink prices, bars offer insane amounts of free food with the purchase of just one drink. The food served during aperitivo isn’t just bar staples like chips and nuts. With aperitivo buffets including salads, pasta, meat and sandwiches, this can easily replace dinner. So for the cost of a drink, you basically get dinner for free. This beloved Milan tradition is fairly widespread. Though they generally follow the same guidelines, any specific aperitivo has its own time and offering of foods. For the most part, you can expect aperitivo to be during Happy Hour, some starting early and ending late, but generally peaking between 6 and 8 pm. Some places offer an aperitivo until as late as 10:30 pm, even on the weekend. Really popular places tend to be slammed during peak hours, either creating a wait for a table or long, busy lines at the buffet table. Though you can have an aperitivo pretty much anywhere in Milan, it might be good to go to a neighborhood with lots of bars and restaurants. For instance, at Navigli and Porta Venezia you can browse the options, food and drink-wise and if one is too busy, you can try elsewhere. Places with a lot of competition around sometimes offer a lot more food choices to one-up the other bars. 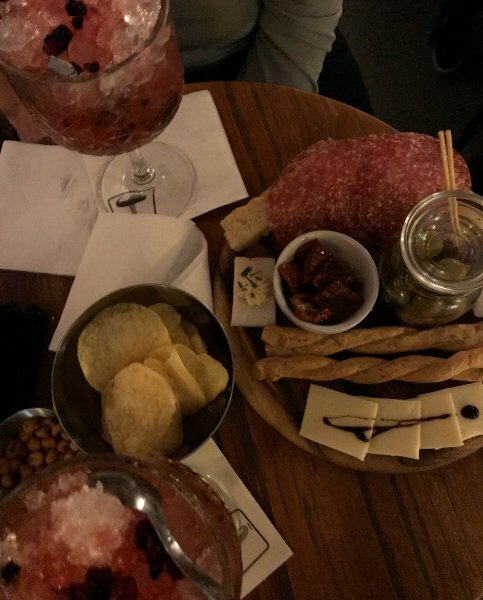 Since the food is the main Happy Hour draw, you shouldn’t expect drink specials when you go to a place that serves an aperitivo. Drinks will be at regular prices, usually 8-10 euro. Some places bring food to your table as your aperitivo. Since many of these bars don’t have food menus at all, you get whatever they happen to be serving that day. For instance, you’ll get a small charcuterie and cheese plate with bread and olives at Twist on a Classic. Other places bring you a variety of crackers and nuts or popcorn. Typically the amount of food you get depends on the number of people at your table. So if they offer ham and cheese finger sandwiches, you’ll get one per person, along with other shareable snacks. Many places offer aperitivo as a buffet. You don’t have to ask for permission. It’s automatically included for everyone at the bar, as long as you’re drinking something, of course. Just grab a plate and serve yourself whatever you want as many times as you want. I would say to not be tacky, but honestly, people are vultures over this food – tourists, locals, everybody. So I think you can pretty much help yourself and no one will care. For the most part, buffest will have snacks such as cheeses, meats, bread, maybe pizza or salad. 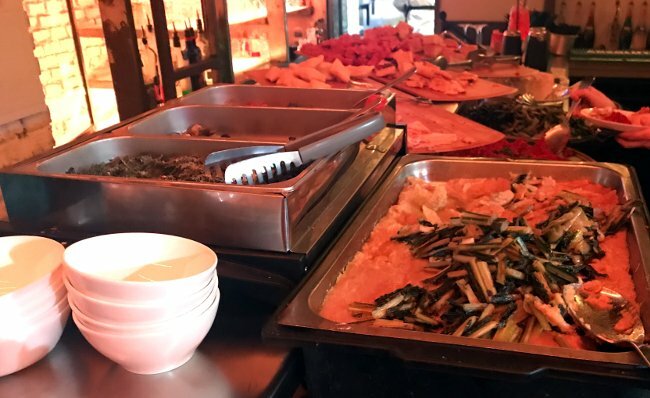 But certain bars really go all out, like Leccomilano, which offers a diverse array of cooked dishes including casseroles, different types of pasta, pizza, vegetables, spreads and breads, even chicken and ribs! Who even wants to eat dinner after that? Also because you’re constantly eating, it’s hard to get drunk. So after you’ve had three 10 euro cocktails, you might feel a little scammed out of the buzz you should have. If that’s the case, ease up on the buffet. Or go somewhere for drinks that doesn’t serve food. If you’re in Milan, though, you have to try the aperitivo at least once. Pair your aperitivo with the traditional Aperol or Campari spritz to complete your Italian Happy Hour. Is the Last Supper worth it?